Picture from kernowclimber : Bencollaghduff, home of black spirits? Picture: Bencollaghduff, home of black spirits? The Spirit of the Black Hags? 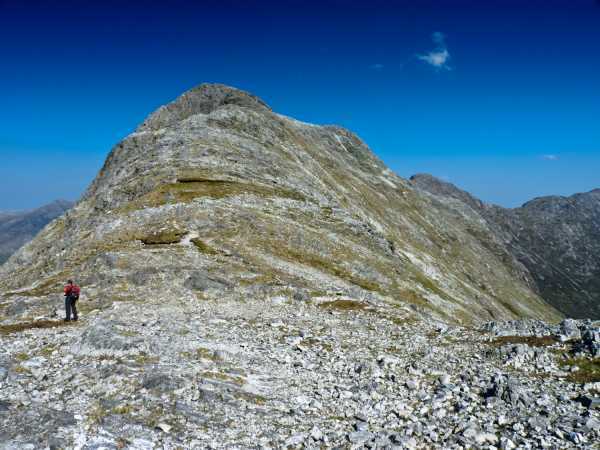 Blessed with glorious weather this weekend in Connemara, we decided to follow Captain Vertigo’s footsteps in these far western parts, yet again, to have a crack at the Owenglin Horseshoe. After descending Benbaun via a very steep route to Maumina Col, we decided to deviate from the horseshoe to bag Bencollaghduff. The mercury had soared up into the mid-twenties down in the valleys, but we had been spared its sapping effect by the constant high wind that kept us coolish as we traversed the mountain tops. However, going up the bare rock of Bencollaghduff, we found ourselves in the lee of the mountain and it became very hot and humid, made worse by the heat being reflected back off the lurid white quartzite rock. It came from nowhere with a whoosh and a crack, like sheets suddenly rent by a huge gust of wind, or a tent being shredded by gale force winds. Then it was gone. I stood bewildered and wondered whether my waterproof had somehow fallen from my back pack and been carried away on the wind. But there was no wind. The sun beat down mercilessly and I began to think that I had imagined it all. I said nothing to Martin, lest he think I was beginning to show signs of heat fatigue! We continued with our climb, pausing momentarily to admire the fine views of the Gleninagh Valley when suddenly, a noise like a high speed train filled the air and with a whoosh, I was partially lifted from the ground by an invisible force as something hit me and passed by with a tumultuous crack and rustle like the sound of a thousand feathered beings. Then silence. This time Martin heard it too, and we began to ruefully laugh at the embarrassed look on each other’s faces. What was this invisible force, this vortex that preyed upon my presence? A spirit unleashed by the ‘black hags’ whose mountain we were assaulting? The answer was far more prosaic. It was a mini whirlwind and we encountered a couple more before we arrived back at the col after summiting Bencollaghduff. They seemed invisible due to the lack of earth or sand to announce their presence and must have been caused by the high winds coming up the ridge that started to spin across the ground.